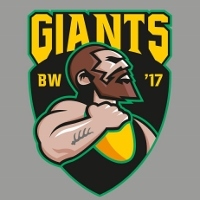 In the only match for Round 6 in the AFLG competition in Germany last weekend, the league’s newest team – the Württemberg Giants – have enjoyed their second win of the season, upsetting the Frankfurt Redbacks by nine points at home. It took a huge last quarter from the Giants, with the Redbacks having led the match at every change. The match was tight from the outset with the Redbacks holding an eight-point lead at quarter-time and just five points at the main break. At the final change, it was still a goal separating the teams. However, a three goal to one burst from the Giants in the final quarter saw them home in a great game. The loss would have been harsh for the Redbacks, yet they are still in the race for a finals berth, equal on wins with the fourth placed Lions. However, the Giants were the big winner, jumping two games clear of bottom-placed Dresden Wolves and, remarkably, just a win outside the top four (though with a poor percentage). It gives incentive for the Giants to finish the season well and maybe snare a final berth. Next weekend will see the Round 7 clashes featuring the Rheinland Lions hosting the Hamburg Dockers in Cologne, the Munch Kangaroos hosting the Württemberg Giants and the Dresden Wolves travelling to Berlin to meet the Crocs. The three top sides – Hamburg, Munich and Berlin – are all featured and will be very conscious of the importance of victory in the run towards the finals.